The word Kettuvallam means ‘boat with knots’ and it is surprising to note that the entire boat holds together with coir knots only. Not even a single nail is used during its construction! Made of planks of jack-wood joined together with coir, it is coated with a caustic black resin made from boiled cashew kernelsKettuvallom (House Boat) is a country boat that was used in the early days for the transport of goods from the isolated interior villages to the towns. With the advent of roads, bridges and ferry services, gradually the Kettuvalloms went off the scene. Now these kettuvalloms are back again as a major tourist attraction. 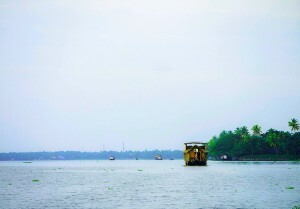 A ride on a Kettuvallom is a fabulous way to explore the fascinating beauty of the backwaters. A houseboat is about 67 feet in length and has a width of around 13 feet in the middle. The materials that go into the making are local and ecofriendly; bamboo poles, coconut fibre, ropes, bamboo mats, carpets etc. The main wood used is “Anjili”. There are houseboats with fully furnished single room, double room and triple rooms. All of them have sundeck, private balcony with comfortable chairs, kitchen and toilet with w.c. In addition there is a separate rest room for the crew. A glide in a “Kettuvallam” (Houseboat) through the enchanting backwaters of Alleppey is sure to rob your heart. Palm fringed narrow canals winding through the vast expanse of paddy fields and the neat tiny hamlets lined up along either side of the canals are panoramic sight one can never forget. The new generation Houseboats are renovated forms of original Kettuvallams. The modern type House Boat have all the creative comforts like a Hotel ie well-furnished bedrooms, modern hygienic toilets, cosy living rooms, dining area, beautiful kitchen and in some cases even a balcony for angling. Most of the Houseboats are powered by remarkably unobtrusive inboard diesel engines and use solar energy for power requirements. The beautiful backwaters of Kerala make a wonderful home to its traditional houseboats that take visitors on a dreamland journey meandering into the numerous lagoons, lakes, canals, estuaries and the deltas of a number of rivers that drain into the Arabian Sea. Tranquility and bliss rules these parts of Kerala as one gets lost into the beauty of swaying coconut groves bordering the shores and the rural lifestyle of the people. The largest backwater stretch in Kerala is the Vembanad Lake, which flows through three districts and opens out into the sea at the Kochi port. It is houseboats that attract a considerable number of tourists to the backwaters. Huge, slow moving, exotic barges used for leisure trips of today are actually the reworked Kettuvalloms of olden times, which were once used to carry tonnes of rice and spices.